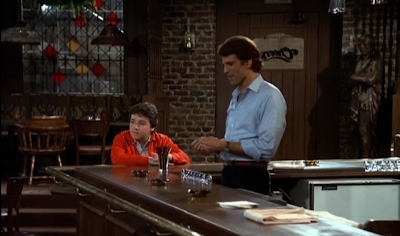 Having Cheers on Netflix Streaming is a glorious thing, isn't it? For me, I've been shocked again and again how much of the show I remember and how much of it shaped my comedic sensibilities without my awareness. ("Oh my god, I got that angle from Cheers? I thought that was mine! DAMMIT!") The entire first season never left the bar and it still worked. Is Diane's character type, the "stuffy and pretentious Ivy League intellectual," still used in comedies? Shelley Long killed it, but the character type felt antiquated. My hunch is that the "stuffy intellectual" plays off of an anxiety that's not so prevalent in the American public anymore, so we don't see it much. Frasier and Niles Crane kept it up, but they may have been the last of the breed. "Intellectual" on teevee now skews towards "Aspergerish science nerds" now, right? Has "stuffy intellectual" gone the way of "lovable, hilarious drunk" as a disused comic type? As I'll talk about later in the week, I was surprised as I rewatched the early seasons at how often we're expected to get and laugh along with Diane's intellectual humor. The whole idea of having TV and movies (early Woody Allen movies, for instance) that makes sly Russian Literature jokes (in amongst broader humor) is just gone. You would hardly see supposedly "high-toned" shows like Downton Abbey making those sorts of references today. Remember when Diane made an avant garde film to convince Woody's hayseed parents that they should let him stay in Boston, but Woody had to inform her "Sorry, Miss Chambers, they thought it was too derivative of Godard." Woody's joke about Godard doesn't require knowledge of Godard's style to function as a joke, it just requires that you understand that "Godard" is the name of a fancy-pants movie director. Which you could pretty much pull from context even if you didn't know it. That's a whole lotta gibberish to me, but I still get the gag. How many of Diane Chambers's jokes do you have to actually understand the reference to appreciate? I think Harvey's point is valid, though. In both cases the highbrow reference is simply processed as "highbrow reference" but you don't need to actually know physics (or have a deep background in film) to get the joke(s). Both shows do a great job of doing what you're both pointing out: making smart jokes that anybody can get just from the context. So yes, thankfully, everyone can laugh every time, but nevertheless that joke is even funnier if you *do* know who Godard is, and that was also frequently true of Diane's zingers. I'm reminded of watching "The Simpsons" in college when Marge was admiring a picture of her mom in a swimsuit as a young woman, and her mom says, "All the boys liked me, it used to drive my girlfriends crazy." "Who were your girlfriends?" "Frances Farmer, Zelda Fitzgerald and Little Sylvie Plath"
Two or three of us died laughing and the rest of the kids were looking at us like we were assholes. Sometimes you have to be willing to lob one over the head of most of your audience in order to make a few of them howl like banshees.